How does your pet react to your Dulcimer playing? Forums » Discussions » OFF TOPIC discussions » Page » How does your pet react to your Dulcimer playing? Do your pets (such as a sophisticated Vizsla -- which is a good title for a song) care about the mode you're in? Seriously! I had a small, loyal and intense tabby cat who would lie next to me in perfect contentment when I played dulcimer. As long as it was Ionian or Mixolydian. If I re-tuned to Aeolian or Dorian she would stiffen up, lay her ears back in fighting position, crouch there stubbornly for a few minutes waiting for me to reconsider the error of my ways, and eventually give up on me and leave the room in a snit. No minor modes for her! That is a very good question! I am kind of a slacker when it comes to tuning, so I stay in mixolydian (or as close as I can get to it) all the time. I may have to do the experiment though. If I were a gambling man, I'd wager a dime to a doughnut that she would be wigged out by phrygian and locrian modes. Probably just because those are the strangest sounding names to me though. I don't have the empirical evidence, yet. Sophisticated Vizsla is a indeed great song name, and I am kicking myself for not calling dibs on that! According to my admittedly lame understanding of copyright law you might now have the rights to it, in perpetuity, and that's a mighty long time! I call dibs on 'The Synchopated Vizsla,' and 'The Exonerated Vizsla.' I think the former could be nice a jazz tune, and the latter a ballad about how her brother (black dog in the previous photo) was stone-cold busted after years of framing her for chewing up raw sweet potatoes while we were out of the house. That is so funny about your tabby cat! She sounds like she was a real character! Oh my goodness I thought I was the only one who's pets react to playing an instrument.It is very odd I have two cats one loves music the other one loathes it.I also play Piano and accordion.When I play any of those instruments along with the Mountain Dulcimer my one cat goes crazy to the point of my having to stop playing. Our vizsla barks, growls, and gives me some distance when I play ukulele or penny whistle. She doesn't seem to mind at all when I play dulcimer though! Our previous cat really liked me to play the dulcimer. She'd walk over to it and meow at me then lay down when I'd start playing. The new cat, Sally, at first didn't show any interest the first few months when she was a little kitten. Maybe it was scary to her. Sally is 7 months old now. Now when I play she comes over to me squeaking and rubbing my legs. I haven't figured out if she is saying she likes it, if if she's saying, "if you're not doing anything worthwhile give me a hug..."
Here's Maggie as I was playing this morning. 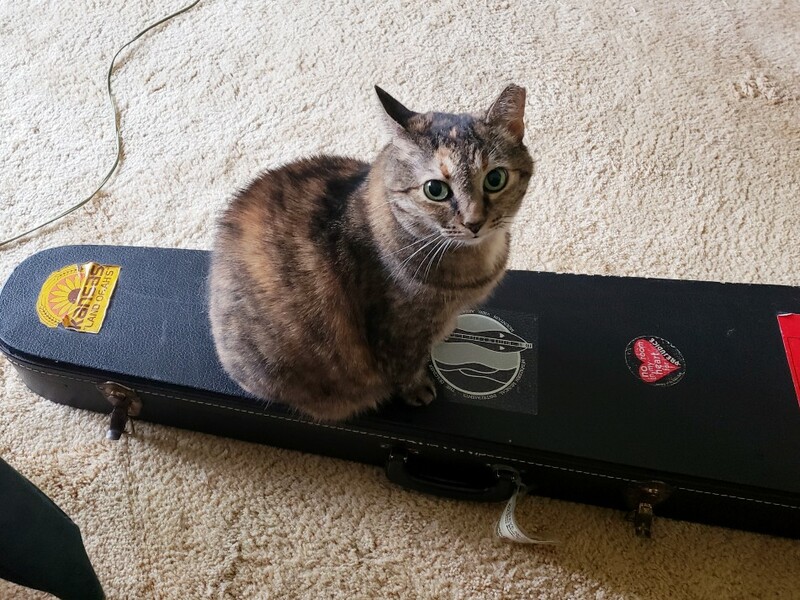 She always comes to be with me when I play, and loves to sit on my case and get the occasional scritch. Cloudy, our other cat, is content to stay on her perch on the sofa, instead. I like to sit outside early in the morning to quietly play some slow airs and hymns on my whistle. This Spring the Doves and Robins come to the fountain and sit and appear to be listening. They stay within a flew feet of me as long as the music lasts. They seem indifferent to the dulcimer. My cat runs out of the room if I so much as touch an instrument. Maybe it is a comment on my playing ability? They say cats can hear an octave higher than dogs even. Sally Ann will be four months in a few days. For some reason she thinks she's the boss. So, David, Sally Ann is a cat. If she is like our cat, she IS the boss. Tis the nature of house cats. It's hard to imagine that she's not this size anymore. The good thing is we don't have to treat her like something very fragile (she's pretty tough, in a nice way, now). This pic is about two months old. That one of the kitten and the dulcimer got me thinking of an old piano instrumental piece called "Kitten on the Keys" and how there needs to be one for Kitten on the Dulcimer -- maybe with some meowing. That's one beautiful cat. I know you will enjoy her. Thanks for adopting a rescue. She's a sweetie, David! Congrats! We brought Sally Ann home Friday and introduced her to our dulcimers. Right now she thinks our house is one big cat toy. I'm thinking she's about 8 weeks old. She could be 9 weeks old. Jack is a true lover of the arts. A few years back I started knitting, and he became obsessed with watching the knitting needles move. He never trys to bother them or eat the yarn, he just watches intently. So when I got my first dulcimer, same thing. He is obsessed. He loves the music. Plus he has decided that he is King of the Dulcimers and guards them. He can always be found laying besides my dulcimer stands. Sometimes he even hits the strings a little making a sound. He is always very careful around them. Strange because it is the only time he is calm. Heather, that is hilarious! I can so picture it because my Labradoodle likes to play the "squeaky" too! My dog settles at my feet when I play the dulcimer. When I pull out the fiddle, she grabs her squeaky toy to play along. I try not to take offense, although I'm learning the fiddle and her assessment of my skills is spot on. Now that's a vieable pic, and not too shabby of a dog either! BTW, while I do know a little about a lot of things, I’m not a FOTMD site moderator. I’m just a naturally helpful person. But please don’t hesitate to go to the “Ask the Moderators” area and, well, ask away anytime! Click on the "Embed Local Media" icon in your msg., right next to Mr. Smilely. You will then see the dropdowns. Okay, if we don't hear from you in 10 minutes, we are sending in the troops. D, when you upload a photo you can pick a different size from the dropdown. Play with it. If you don't like the size, or location of the photo. click on it in your message, and try again. So definitely not a pet, but PROOF that those rascally squirrels are stealing my tomatoes! D, think about resizing your pic to large so we can see without downloading it. we wouldn't want to miss a cute pet shot! my cats look at me and say " put down that piece of wood and pet me "
The older cat, Tyrie, just ignores it. Maggie (she's in my icon) rubs up against the tuning pegs and generally gets in the way. d-chitwood, I have a dog that is afraid of her water dish! She approaches it like a gazelle drinking at a water hole with a croc waiting in it . 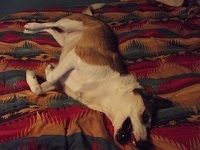 We have a lab and a very sensitive, slightly neurotic English Shepherd (picture a black and white border collie). He is extremely sensitive to any change in the atmosphere, whether it's a slight tone shift in a conversation, or maybe a cat is tip-toeing up the street in the middle of the night. He hears it all and is aware of everything. Depending on which song I play, he might just lie still on his bed and quietly cry the whole time. Other times, say with something like Black Mountain Rag, he might huff and run purpose circles around the downstairs. The other animals ignore me. my pup, saint is right with me when I'm playing. If I go to long (way over an hour) he will come around in front, look at me than put his head on the strings. He is sweet and as soon as I pick up the dulcimer he goes right to our spot. He is a good companian. My girl Shylo tried to play my dulcimer. I set it on the floor for a minute and she pawed at the strings. After my heart rate slowed down. I told her she did a good job. Didn't want to hurt her feelings. Looks like Wiskers wants to know where the carpet covering is on her new cat tree. Just found a New/Old Hammnerd Dulcimer and my cat wiskers wants lessons!!!! As one can see in this previously posted photo, our three cats find my playing interesting. They seem to particularly like "Grey Cat on a tennessee Farm"
My 3 furry amigos . Usually one or two will wander in and plop down next to me or even rub the dulcimer as I try to play it. Our two labs, Seamus and Ruby, follow me into our library where we have chairs and stands set up, and just lay down and sleep there I play my dulcimer. You think that's funny? Murray (the Manatee) wants to take the vocal solo and the instrumental break on Old Man(atee) River! My dog was jelous at first, of the time I spent focusing on playing, but after awhile she got used to it. Smiley Friend, does a humming type howl when I am listening to dulcimer music, he especially likes to hear Ken Backer and other deep male voices, then he really sings. Smiley just stares at me when I play. Sally's dog and cats pretty much ignore my playing. On the other hand, my pet Manatee and I are working up a duet set of water songs. How do your pets react to your playing? My older cat Fifi likes to sleep on my feet as I play . My dog Scout doesn't know what to make of it (that's her reaction to most things), and my young cat Baby is too busy causing mayhem, bringing in her trophys for us to admire , to care.